Attach an 8' x 3' sheet of plywood to the wall of my garage. Attach two hooks to the plywood. Put a shelf above the hooks for stuff like shoes, helmet, etc. In completing this project, I learned a few things. The wall in my garage is 7' 11'' high, not 8'. Studs are generally spaced at 16''. Be suspicious of other numbers, no matter how solid (or otherwise) the wall sounds when you knock on it. 4'' full-thread screws are too much for my power drill/screwdriver to drive. And the heads will totally strip. 3'' half-thread T25 "star drive" (AKA "torx") screws are fine. But they'll still need pilot holes. Pilot holes make everything easier. And I realized my design was totally not simple enough. There's no point putting a shelf above the bikes. You can't reach it because the bikes stick out too far. There's no point using a giant sheet of plywood. It just makes the whole project harder, with no payoff. It would have been better to use a 2' x 3' section of plywood to mount the hooks, and another to protect the wall against the back tires. 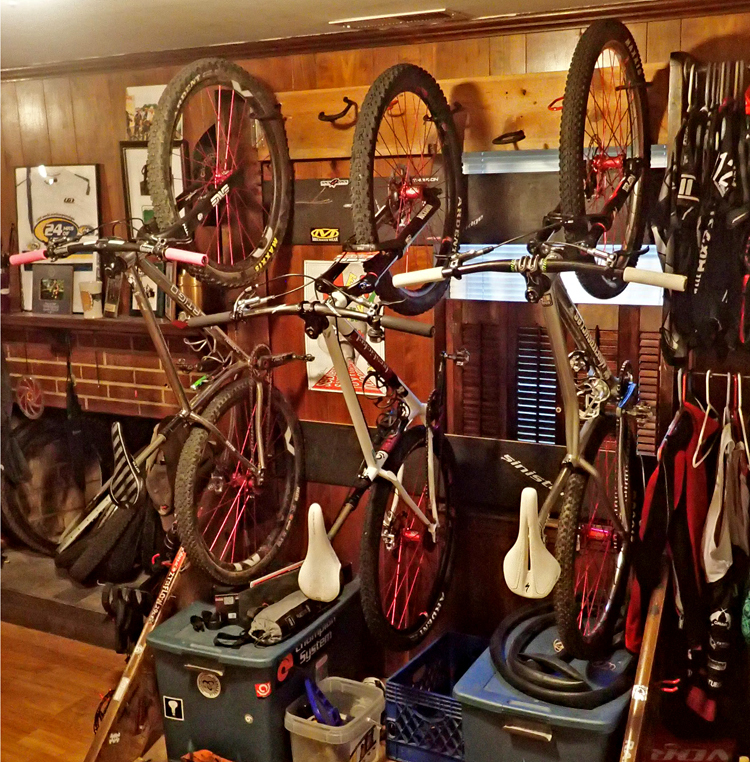 Since I'd planned to put a shelf above the bikes (which was dumb, see above), I was focused on putting the hooks as low to the ground as possible. I should have put the hooks as high as possible, so that I could stash storage bins, etc. under the bikes. That said, having that giant sheet of plywood makes it easy to move the hooks wherever I want. So I might just do that.